I already wrote three articles about Japanese vintage Strats, an introduction and a portrait of the fiesta red and the pink metallic Squier JV. 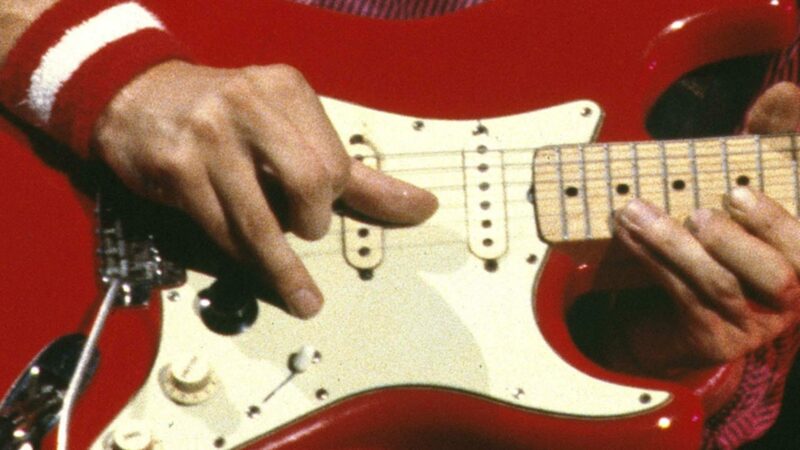 I noticed that a lot of people surf into this site because of these articles, so I want to release a fourth one, this time about the almost legendary Tokai Springy Sound Strats. Many years ago I had on of these myself. This was about 1980. I was already a huge Dire Straits fan. 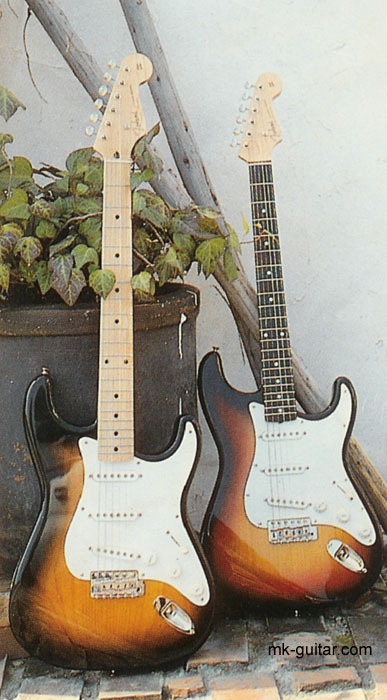 Mark Knopfler was still associated with his red Fender Strats (although in fact he had just started to play Schecter that year). Red guitars were rare in the guitar shops – or rather non-existent. Fender had dropped fiesta red eleven years before, in 1969, and in fact I had never seen a fiesta red Strat at all until then. One day I visited the local guitar shop – something I did regularly, just to see and to play as many guitars as possible. And on this shelf there was this elegant looking fiesta red Tokai Stratocaster. But besides the cool colour, there was something else that was unique: it was a replica of a 1964 Fender vintage Stratocaster, it really looked like a pre-CBS Fender. The regular Strats still had that ugly large peghead that CBS had introduced in 1966, and at that time they all had black plastic parts. But this Tokai had the classic small head, a white pickguard with white knobs, staggered vintage style pick-ups, a separate tremolo block, the correct kind of pickguard screws, a light alder body, and even a decal that looked like the old Fender spaghetti logo see pictues below) – in short, it was exactly like those legendardy old Fender Strats at a time when Fender was still building those infamous 70ies style Strats that were so heavy that they got the nickname boat anchor. No question that I had to play that guitar: it also sounded much more like a vintage Strat than the contemporary Strats. I had to have this guitar, which was priced at 825,- German Marks (the equivalent of 420,- € /US $ 540). I was fourteen, and that was a lot of money (especially after I got my first guitar only one and a half year before, a 2nd-hand Fender Strat from 1976), much more than I had. Fortunately this was about two weeks before Christmas, and I somehow got it managed that I got this guitar from all the money coming from different aunts, uncles and grandma’s. By the way, soon after the release of these Tokai Strats, Fender won a lawsuit so Tokai had to change the design of the spaghetti logo decal. The series after the Springy Sound is also great but less sought-after than the ones from before. I still have a rare vintage catalogue from those days, and the following pictures are all from this source. I had a sunburst Springy Sound all original years ago (from an eBay auction) in very good shape (like 90% + condition) and it was a really nice guitar. Like a fool, I let it slip away and made a couple hundred on it at the time. You’ll see that I have a Tokai Les Paul Reborn Old on eBay now (made in 1 calendar year only) if you care to look it over. Thanks for the memory! I am only 15 but am lucky enough to have a beautiful sunburst springysound with a white scratchplate. I got it from my grandfather about 2 years ago. It’s a beautiful guitar (to look at and to play) and I certainly don’t plan on selling it anytime soon! I have a Greco supersounds built in 79 and it sounds sweet, plays great. One of my favorite strats. Really better than any Fender i had, US and Japanese. Very underated guitars. Only reason Tokai is more popular is because Grecos were built for the domestic market and Tokais were sold everywhere.